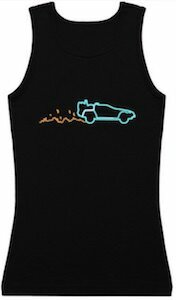 Back To The Future fans can now have this Neon DeLorean Tank Top. This Back To The Future tank top comes in styles for both men and women and in some fun colors and many sizes and if you would like t-shirt in stead then you are in luck as they are available too. On the tank top you can see the famous DeLorean time machine with some sparks behind it and all that looks like a neon sign and that really make it look unique and special. If you like a cool shirt even if you don’t like Back To The Future then this neon car just flying off is what you need. If you like Back To The Future and want something fun then check out this Marty Mcfly Precious Moments Figurine. 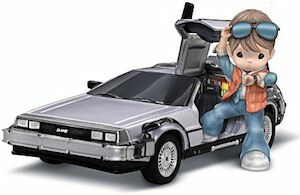 We all know the amazing looking Precious Moments figurines and this one shows Marty Mcfly while he is getting out of the DeLorean time machine car. The figurine has the typical cute look like we know for the Precious Moments figures but it still is so obvious Back To The Future. The highly detailed figurine is made from resin and is 7 1/4 inches long and will be a must have for the true fans of Back To The Future and Precious Moments. 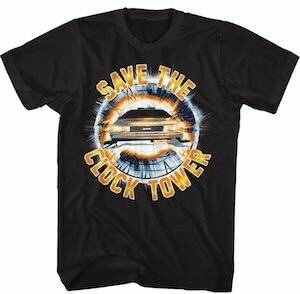 If you want a cool Back To The Future t-shirt then you should check out this save the clock tower t-shirt. The shirt does not only have a print on the front but even on the back. The front shows the DeLorean time machine car as it is flying in from a different time and around the car it says “Save The Clock Tower”. The back of the t-shirt shows the back of the car as if it is leaving the other time and it also shows the Back To The Future logo. You can get this amazing Back To The Future t-shirt in men’s sizes Small – 6XL and it is made from preshrunk cotton. 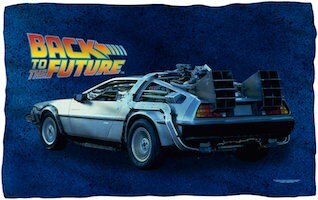 If you like time machines and napping then you need this DeLorean fleece blanket. The Back To The Future fans can now have this blanket that shows a big picture of the DeLorean time machine and then there is the Back To The Future logo too. The Back To The Future blanket is available in two sizes 36 x 58 inches and 48 x 80 inches so that you can get the size that fits your needs. Now you can warm under the DeLorean while rewatching all the Back To The Future movies. A cool blanket like this is great for the bed and a picnic to0 so you can have the classic Back To The Future ready for all your blanket needs. If Back To The Future is your kinds of movie then you should check out this DeLorean time machine pillow. 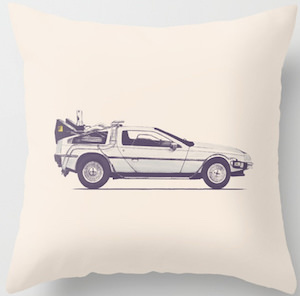 The throw pillow is plain and light in color and on that you find a nice black and white image of the famous DeLorean as a time machine like used in the Back To The Future movies. You can get this DeLorean pillow in an indoor and an outdoor version and it comes in 4 different sizes from 16 all the way to 24 inches and all are square. A pillow like this would look great on the couch at home but works great on the backseat of your car too even though yours can’t travel in time. Marty McFly always ran into the bully of Biff Tannen. But as all fans know that all changed later on in the awesome movie series of Back To The Future. 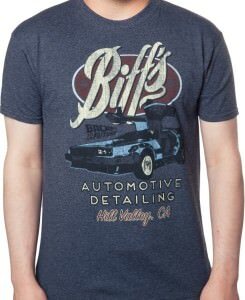 On the front of this t-shirt you see the logo and saying of Biff’s Automotive Detailing, Hill Valley California. Also in the center of the shirt you see Emmett Brown’s car the DeLorean as well as the official Back To The Future movie logo. Available in a wide selection of unisex sizes that range from Small to 2XL so all can enjoy this Back To The Future t-shirt. It is made from 100% cotton giving you a very soft and comfy t-shirt while also super durable and long lasting. The amazing time machine car the DeLorean from the hit series of movies Back To The Future is now available for you to take home today….. well in awesome LEGO version that is. This LEGO DeLorean has every little detail you see in the movies with wires, hoses, flux capacitor, bumpers and a licenses plate that says “California OUTATIME”. The gull-wing doors open and your LEGO minifigures can fit inside, the wheels fold in to go into hover mode. Also included is two minifigures, find Dr. Emmett ‘Doc’ Brown in his white lab coat and Marty McFly with his orange vest and also a purple fuctionable skateboard. The DeLorean measures approximately 2 inches hgh x 5 inches long x 3 inches wide. You will also get the building instructions along with an exclusive Back to the Future information booklet. 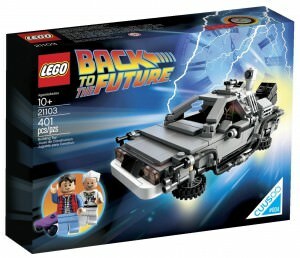 Start building today with the Back To The Future LEGO DeLoren Model. Women who like Back to the Future will love this t-shirt. The t-shirt is white and has the timetraveling DeLorean car printed on it and the words Back to the future and the back to the future logo. And this Back to the Future t-shirt comes in a junior fit in a wide selection of sizes to make it fit just right. If you are that woman the like to watch Michael J. 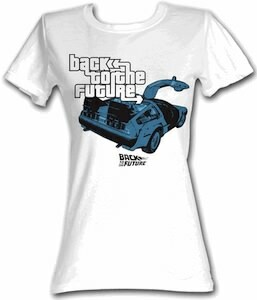 Fox movies the check out this Women’s Back To The Future T-Shirt. OK maybe this is not an official Back To The Future product but it looks pretty amazing. Of course there is the DeLorean in witch Marty McFly travels through time. 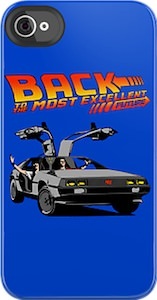 And there is something that looks like the Back To The Future Logo but it actually says “Back to the most excellent future”. This case is availible for a big range of Apple products. You can get it for the iPhone 4 all the way to the iPhone 6 plus. Having no case on your iPhone or iPod Touch is not a smart thing so start browsing for the case that fit with you. But now have a better look at this Back To The Future iPhone / iPod Touch Case. Here is the classic Back To The Future poster just like how we remember it from way way back in time. 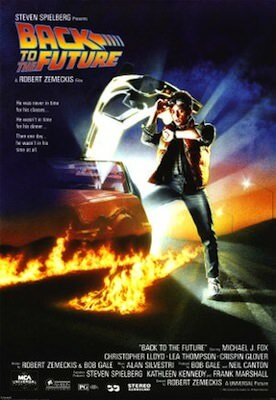 The poster shows Marty McFly and the DeLorean and even fire tracks like we seen in the movie when Marty travels in time. This poster is a must have classic poster that is just part of movie history. Be part of movie history with this Back To The Future Movie Poster.